Access via our mobile version. Know who has viewed or confirmed receipt of their schedule each week. Send schedule reminders to everyone helping on a certain day. 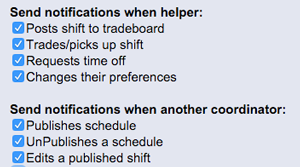 Allow helpers to trade and pick up shifts. Let AutoFill work out your schedule. Try out our Analyze feature. Set up other Coordinators to help with the scheduling.